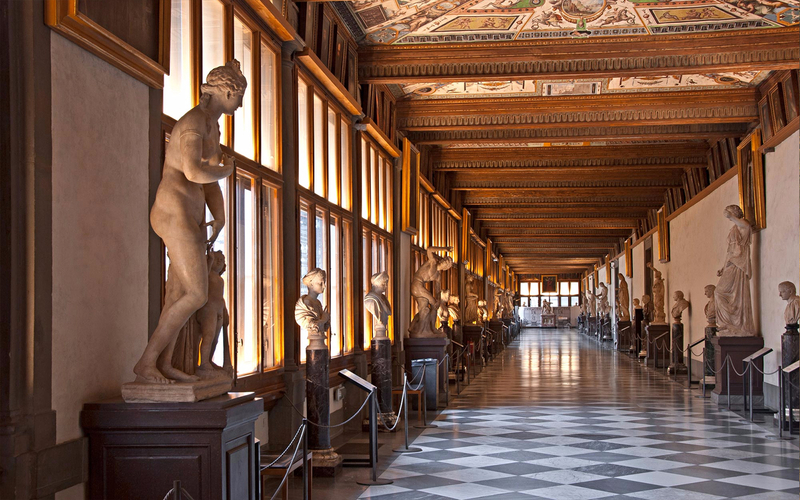 The Uffizi Gallery features works from some of the greatest artists of all time and, as such, the collection housed in this magnificent building gets quite a draw, especially during peak season, when the lines can get several hours long. Fortunately, you won't have to worry about that with your tickets. Timed entry ensures that only a certain number of people gain access to the Gallery at any given time so you get to bypass the ticketing line and exchange your voucher for physical tickets at the counter for people with existing reservations. Though there may be a slight wait on hectic days, the line here is still dwarfed by the normal entry and ticketing line. Once you exchange your voucher for a physical ticket and get through the security check, all you have to do is walk straight in! Then you are free to stay and explore the intricacies of the various compositions on display and marvel at the work of genius artists like Da Vinci, Raffaello, Masaccio, Cimabue, and Giotto. 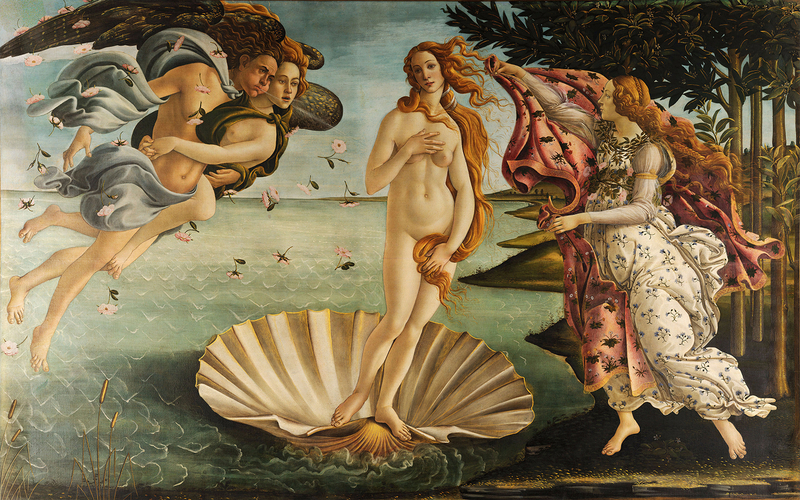 Visit the Botticelli room and admire the Birth of Venus and Primavera, two of the most famous examples of Italian Renaissance art. 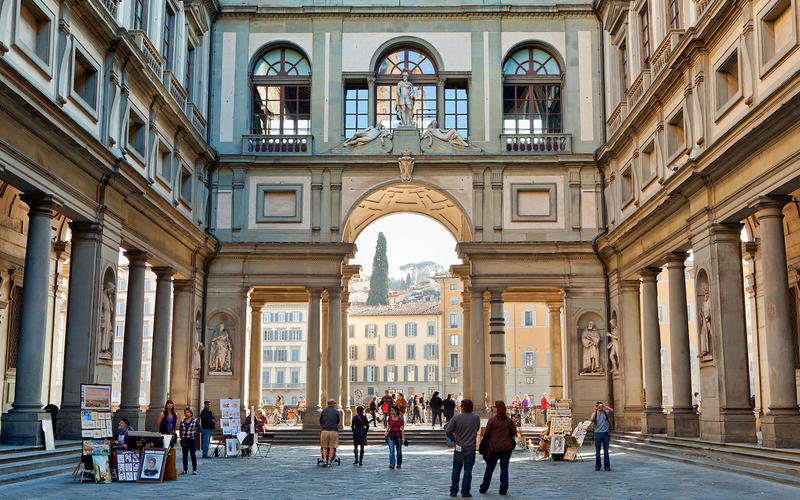 A must see destination for all visitors of Florence, the Uffizi is bound to leave you spellbound and awestruck. Benefit from this timed ticket that lets you skip the long ticket lines to the museum and gain priority access to the unique Uffizi Gallery, where you can spend as much time as you'd like. Enjoy the unique collections at Florence's Most Visited Museum and discover the many works of art ranging from the 12th century to the 17th century, including Botticelli's famed "Birth of Venus". Purchase your tickets online with Headout and avoid significantly longer queues at the Gallery for on-site tickets. Your tickets allow you priority access into the gallery, however, there may be a short wait at the ticket counter at Door number 3 where you will have to exchange your mobile voucher for the physical ticket. You can then gain entry at Door number 1 through the "People with Reservation Entry" after going through a mandatory security check. Should you pick the "With Host" option in the next step of the booking, you need not go to Door 3. Please proceed directly to Door 1 and collect your ticket from the host before proceeding inside. Due to security reasons, the gallery can only accommodate a certain number of people at any given time so, if space allows, you may be moved to a slightly earlier or later time slot upon arrival. The Gallery is open Tuesday through Sunday from 8:15 AM - 6:50 PM. Last admission to the gallery is at 4:45 PM. The Gallery is closed on Monday. Please note that the date and time you choose for entry is binding. Please arrive 30 minutes before your scheduled entrance time to the ticket counter where you can exchange your mobile voucher for a physical ticket. Entry for those below the age of 18, regardless of nationality, is free, as is entry for EU citizens below the age of 25. You must collect the reduced price tickets at the gallery itself. Your IDs will be checked at the entrance. By Bus: The closest bus stop is the Ponte Vecchio bus stop. The Uffizi Gallery is a mere 1-minute walk from the bus stop. You will then make your way to the ticket counter at Door 3 to exchange your mobile voucher for a physical ticket, after which you can head to Door 1 and head in (look for the 'People with Reservations' sign). The venue is wheelchair friendly and guests with any mobility impairments will be helped by the staff. All large bags, backpacks, and umbrellas must be left at the cloakroom. There is no charge for this. You will receive an email with your mobile voucher shortly. You need not print your voucher. Please display your voucher on your mobile phone with a valid photo ID at the ticket counter at Door 3 to exchange your mobile voucher for a physical ticket, after which you can head to Door 1 and head in (look for the 'People with Reservations' sign). Please note that you will still have to go through security check. It is advisable to reach 20-30 mins before your time slot.